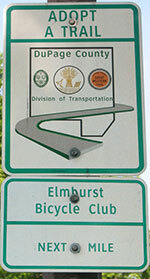 The Elmhurst Bicycling Club, being one of the larger and most active bike clubs, has the gravitas to have successfully influenced government policy, state, county and village planning, as well as local governance on issues related to bicycling, hiking, walking and other healthy activities. This page shows some of what we are involved with, some of what we have accomplished, and a brief introduction to those who forge ahead tirelessly while wearing the mantle of bicycling advocate. Club member for many years. Currently also serving as club Secretary. Club member for many years. Currently also serving as Awards & Club Attire Co-chair. Club Advocate Chairperson for many years. Still contributing heavily on the advocacy scene. 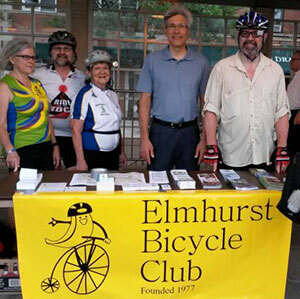 Every Spring, in coordination with the Active Transportation Alliance and the DuPage County Trail Development, the Club has rallied at the Elmhurst and other city Metra train stations to encourage people to bike to their local Metra station rather than drive a car. "Goodie bags" are distributed to those demonstrating that they have biked in. The bag contents change every year, usually including maps and other bicycle related materials. 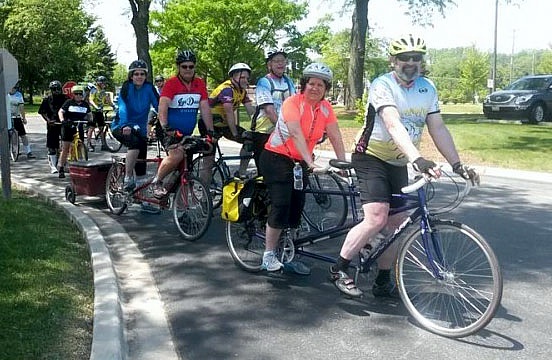 Members of Elmhurst Bicycle Club and the Chicago Area Tandem Society team up with WDSRA (Western DuPage Special Recreation Association), NEDSRA, and SEASPAR to provide tandem bicycle outings for visually impaired riders. At the start, they adjust the tandems and helmets for proper fit. The routes vary for each ride and include the Illinois Prairie Path, the Great Western Trail, and the Morton Arboretum. 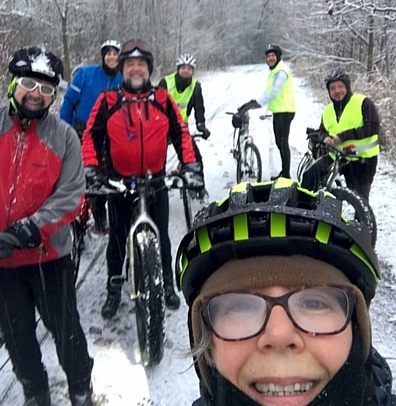 Thanks to the initiative of Betty Bond, Marge Ricke and Baltimore Ortega, the Elmhurst Bicycle Club has made a commitment to keep a section of the Illinois Prairie Path clean. The adopted 1.1 mile stretch runs from Monterey Avenue in Villa Park east to Pioneer Park in Elmhurst. Regular clean up projects will be scheduled as needed. Thanks to the members who participated in the first clean up on April 11, 2015, many of which are shown in the photo below. Adopt-a-Trail cleanup by EBC volunteers. Project Mobility is a 501(c)(3) nonprofit organization that builds specialized bicycles for Children and Wounded Warriors with physical disabilities. 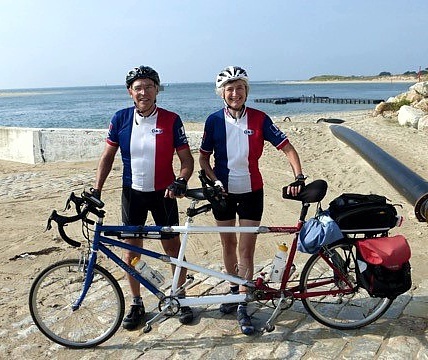 Their professional staff works with families, rehabilitative professionals, and organizations to promote better health, independence, and most of all the freedom of mobility that comes from riding bicycles . Hal Honeyman heads the Organization and also owns The Bike Rack which is an EBC Sponsor. EBC has supported Project Mobility for years, helping them fund the building of bikes for physically challenged children. EBC will match donations up to $1000.00. 100% of all money donated will go to buy a specially adapted bikes for children with disabilities. We will present those bikes to the children at an EBC meeting early in 2019. Attend meetings and events to show your support for bicycling. Watch for email list server messages for specific action information. Find your Legislators and their contact information. Contact your legislators about current cycling issues. Join groups that participate in advocacy activities. See the local, state and national groups on our Ride Planning MEGA-Links Page . Project Mobility Donations Presentations EBC donated $2,500 and club members donated and raised an additional $4,000. Project Mobility matched the EBC effort with another $6,500. These funds provided six physically challenged children with adaptive bikes or trikes.